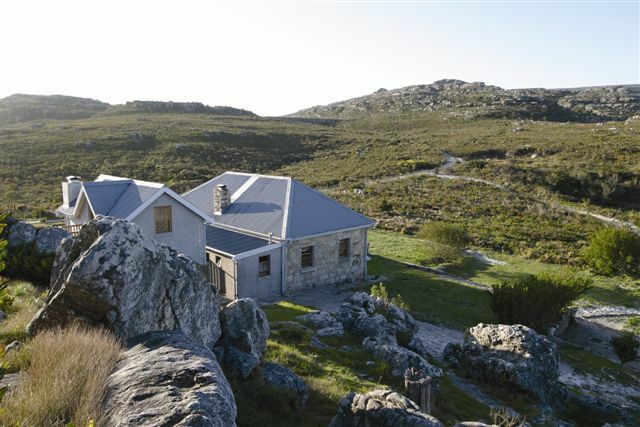 Join us for hike to Overseers Cottage on top of Table Mountain ! See the sun set and enjoy a traditional South African braai. Wake up on Table Mountain to the sunrise the next morning. Meet your guide/s in Kirstenbosch Botanical Gardens on the eastern side of the mountain at 09h00. We start with a tour through the gardens to the contour path. From here the mountain guide will select the route to be taken for the trek to the top, according to the group’s ability and the weather. The prefered route would be via Skeleton Gorge, down the historic Smuts Track (named after General Jan Smuts – avid mountain walker) to the Overseers Cottage for lunch. After a short rest we set out to explore the Back Table and the views of Camps Bay and the Atlantic seaboard from Kasteelspoort, around the dams, visit the museum, before returning to the cottage. After a hot shower, take an evening stroll to enjoy the views overlooking False Bay and the distant mountain ranges and the special Orange Kloof Valley. Watch the sun set over Hout Bay and the Atlantic Ocean. Return to the Cottage for pre-dinner cocktail while we start the preparation of your special South African braai (barbecue). A full three course meal is prepared professionaly by our chef and includes salads, a selection of meats and vegtables . Dinner is rounded off with home made Malva Pudding and a glass of wine, before retiring to the comfortable beds. Early morning wake up to watch the sun rise (optional) over False Bay. A wholesome breakfast is prepared and consumed heartily before we make our way back to Smuts Track at the top of Skeleton Gorge. Then it’s on up to Maclears Beacon. The highest point at 1087 mts, with magnificent views all around. We then walk along the front table towards the Upper Cable Car. This part of the hike gives us breathtaking views over the City and Lions Head. We go down from the mountain via Plattklip Gorge (or the cable car as an option – weather permiting) where our transport will be waiting to take us back to Kirstenbosch to collect our vehicles and luggage. Note : in case of bad weather and the cable car being closed, we will descend either by way of Skeleton Gorge or Platteklip Gorge. Disclaimer : we can obviously not gurantee clear viewing of either the sunset or the moonrise if there is cloud cover. Cost from R1660 per person, inclusive of all accommodation, catering, guiding and transport – R 105 for cable car is an optional extra (if open) . Minimum party of 6 people, Maximum 12 people. Included, all porterage, accommodation and catering, refreshments for hikes, mountain guide. Additional beverages available as cash bar or bring your own. Do you have a group we can join as two ladies between 19 and 25 March?